At a recent visit to hospital, I saw the following sign. 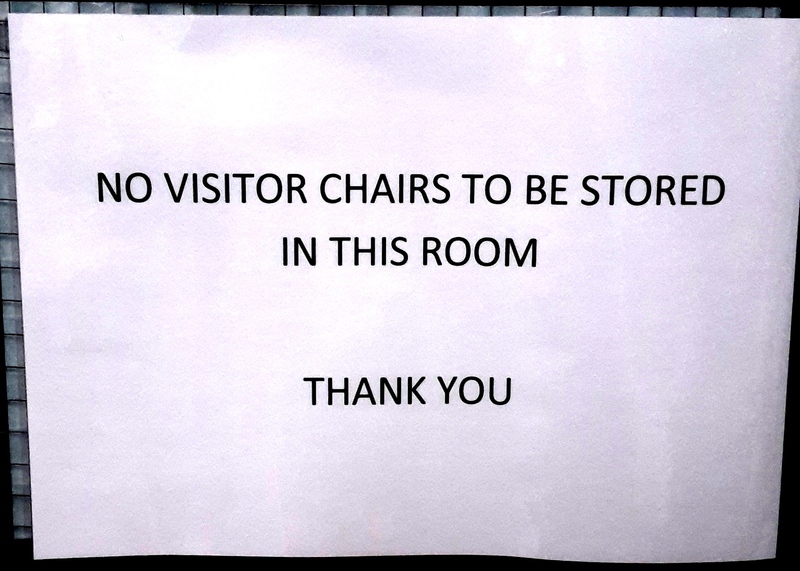 Unsurprisingly, this is where the visitor’s chairs were stored. It got me thinking….What is the point of that rule? It is obvious that everyone was ignoring it. What does that mean for the other rules (and protocols) which are laid out? Are they too ignored, because there is obviously a scant regard for this one. What will the patient care implications of ignored rules? What are the health and safety implications? Surely they need to enforce the rule, adapt it or let it go. In the same way we need to consider why we have protocols, processes or SOPs? In small businesses they can seem like a drag to create but done correctly they can be massively beneficial. For businesses with more than five employees, written health and safety statements and protocols are a legal requirement. Having protocols in place, providing suitable training and PPE can help to protect your business from litigation. Having the current protocols stored and archived (with time stamped versions) allows you to go back and show development of policies – useful for many quality assurance schemes. They can reduce workplace injury or illness and the distress that causes the employee and the stress it puts on your business. Having written processes or protocols can also help you to achieve consistency in your service or your product. Customers like to know what to expect. They want to know that every burger they buy from a fast food restaurant will taste the same; they will always be greeted in a friendly manner when they arrive at the hotel reception; and their loved ones will receive the same excellent level of care no matter which healthcare worker is on night duty at the care home. Where there is that consistency, you will maintain your client base and build on their recommendations. A culture of disregard towards protocols can have serious health and safety implications. From personal experience I have challenged a pregnant staff member who was counting out tablets, by hand, whilst not using appropriate PPE. Her response was that ‘Oh well, we don’t normally bother as it takes too long to put the gloves on!’ Due to the culture of disregard for protocols in the business the she was unaware of the importance on this occasion. What can we do to overcome this culture of disregard? Make sure the team members are aware of the importance of the protocol. Importance should be the first paragraph of all your protocols. Relate it to their wellbeing, that of their colleagues, the success of the business and the expectation of your clients/customers. Consult with your team members to come up with agreed protocols. You don’t always have the best view from behind you desk! The Health and Safety executive recommend involving your employees in formulating protocols. Make sure training on processes is accessible to all team members – not everyone learns in the same way. Check their understanding. Attending a course or reading a document isn’t always enough for information to sink in. Refreshing of training is often necessary, both to help retention of knowledge but also to introduce changes. Make sure you have a system in place which allows you to track and refresh your team’s knowledge. Have a single accessible source of information which is always available for reference. Using an online platform, such as Training-Progress will ensure the same up to date content is available through-out the organisation. Monitor the actions of your team members. Take time watching your employees performing their tasks – are protocols being adhered to? If not, is it and individual or a common problem. Encourage a ‘no blame’ culture so that when team members have concerns about colleague they can raise these with management without the fear of penalisation for them or their colleague. The help buttons on Training-Progress can be used to highlight discrepancies. Don’t feel you have to do everything in-house. External training providers are often excellent value for money, but make sure that the end user content (be it training or written protocols) is entirely relevant to your business. Training which is not directly tailored to your organisation can lead to uncertainty amongst your team. By working with your team and ensuring they understand the need for consistently adhered to protocols and monitoring uptake, you can develop a team which is strong, consistent, safe and empowered.